Japanese Prefectural Association observes 50th anniversary. Japanese Prefectural Association of Southern California (Nanka Kenjinkai Kyogikai) members and supporters take a group photo at the 50th anniversary banquet held on Sept. 14 at Quiet Cannon in Montebello. 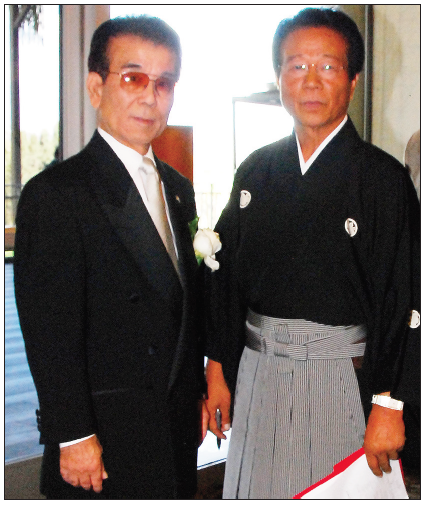 MONTEBELLO — The 50th anniversary banquet of the Japanese Prefectural Association of Southern California (JPASC) was attended by almost 500 participants — the largest gathering at their function in recent years — at the Quiet Cannon banquet hall in Montebello on Sept. 14. Akemi Miyake receives the former president’s service award. The event planning for the historic celebration began in 2013, with monthly meetings by the 50th Anniversary Committee, headed by Chogi Higa as executive chairman of the anniversary event and Yasoji Matsuoka as the executive director of the organization. Throughout this year, the prefectural organization, also known as Nanka Kenjinkai Kyogikai, has a series of events concluding with an engeikai (stage-performance) scholarship fundraising event. They will also be publishing a commemorative book later this year, documenting the organization’s history. On the day of the event, program supervisors at the venue included Happy Mizutani, Masami Kobayashi, and Yasoji Matsuoka, who worked diligently to make the program proceed efficiently and on schedule. Attendees were provided with commemoration gifts prepared by Masumi Muya, a filet mignon and salmon lunch, along with a special gift of traditional mochi, donated by Kaoru Kawata, president of Imuraya USA Inc.
Yasoji Matsuoka emceed the program in both English and Japanese to be inclusive to the multi-generations of guests that were present. He provided the grand announcement for the entrance of the Consul General Hidehisa Horinouchi and his wife, Sabine Horinouchi, followed by Sadao Tome, current president of the Japanese Prefectural Association, to the musical backdrop of the Japanese national anthem. Popular Japanese vocalist Keiko Takeshita contributed her talents by singing both the Japanese and American national anthems. Higa gave the introduction, “It is amazing how the years have flown by. It was 50 years ago in 1964 that Toshiro Shimanouchi, the consul general of Japan at the time, suggested the forming of an umbrella organization encompassing a large spectrum of kenjinkais (prefectural associations) to better organize in supporting the needs of the community,” Higa said, explaining the historical beginning of the organization. Chogi Higa, executive chairman of the event, is joined by Yasoji Matsuoka, executive director of the Japanese Prefectural Association. Many of the speakers, including Yoko Mazza and Yasumasa Hirayama, who gave a detailed history of the Japanese Prefectural Association, along with Akemi Miyake, who later gave an inspirational toast, weaved the 2011 earthquake relief efforts into their speeches. As in all ceremonial events, individuals and groups were recognized that contributed to the mission of the organization.Awards were presented to everyone from performers that contributed their talents in fundraisers to financial donors to the scholarship fund. The presentation culminated in recognition of all the living former presidents of the Japanese Prefectural Association. The second half of the program included a combination of classical dances and folk songs. Highlights of the afternoon included a humorous theatrical skit by Tak Nishi as a blind samurai, which evoked laughter from the audience, and a fast-paced Okinawan dance by young performers of Kansenkai. 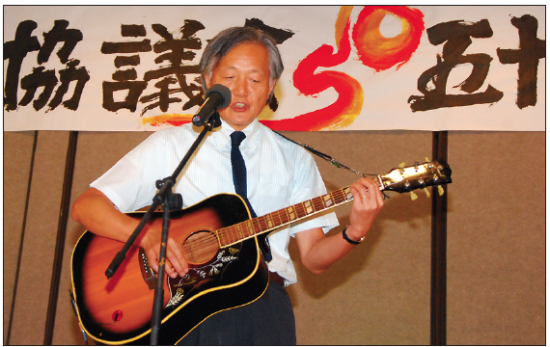 The entertainment climaxed with a performance by the consul general, who sang the hit song “Sukiyaki” (Ue o Muite Arukou), alternating between English and Japanese verses while playing his own acoustic guitar. 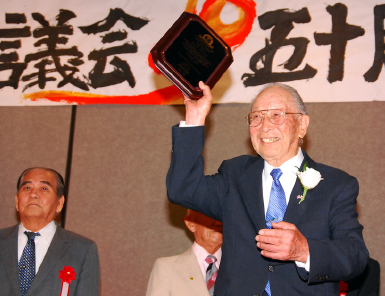 Closing remarks were given by former president Hisamori Iwashita, and the program ended with repetitions of collective hand-clapping by hundreds of attendees, guided by members of the Japanese Prefectural Association, to signify unity for the next 50 years to come. Consul General Harry Hidehisa Horinouchi performs “Sukiyaki” for the gathering.